If you’re of a certain age, the outdoor clothing you wore as a child may also have had a World War II lineage. Which may mean that you, too, were present at the revolution in outdoor clothing that took place in the latter decades of the 20th century. As we grew into young adults, new petroleum-based fabrics — stretchy, breathable, water-resistant, warm when wet — transformed the outdoor experience. From base layers to outerwear, from our feet to our heads and hands, we bought “technical” clothing that kept us warmer and drier, weighed less in our packs, and didn’t restrict our movement on the slopes or cliffs. One of the companies in the “technical” clothing vanguard was Patagonia, whose founder, Yvon Chouinard, had revolutionized climbing gear in the 1960s. In 1980 the company introduced long underwear made from polypropylene, a synthetic fiber that had been used in marine ropes and disposable diapers. “Polypro” insulated without absorbing moisture. And though it acquired a fearsome stink after a season of hard use, it didn’t itch. In its company history, Patagonia calls itself “the first company to teach the concept of layering to the outdoor community,” and my consumer’s experience backs up their claim. As revolutions often do, this one moved down to children. Again, Patagonia led the way, designing outdoor clothing out of its new fabrics for babies and children. “No union suits for this one!” I wrote to a climbing friend after her daughter was born in the early 1980s, attaching my note to a soft fleece bunting. Three decades later, families reap the benefits of ongoing research in outdoor fabrics. The clothing we buy for our children to wear outdoors comes from a wide variety of manufacturers in many styles, sizes, and price points. We are the beneficiaries, as well, of a continuing search for what Patagonia calls “the cleanest line” — the most sustainable approach to the environment, including the gear and clothing that we purchase and use. Companies use recycled plastics in their synthetic fabrics, work with cotton growers to reduce and eliminate pesticides, and track the environmental impact of their products, from the manufacturing process to our front doors. So I was intrigued when someone from Icebreaker, a company I hadn’t heard of before, contacted me a few months ago. The company, based in New Zealand, has manufactured outdoor clothing in merino wool since 1994. They offered to send me some samples and to talk to me about the development of their children’s clothing line. After speaking with Michelle Mitchell, the general manager of Icebreaker’s kids business unit, I have a sense that the revolution is continuing — but also circling back in interesting, even surprising, ways. Like U.S. companies Ibex and SmartWool, which also started in the 1990s, Icebreaker is pursuing research in non-synthetic fabrics such as wool. “In New Zealand, everyone grew up wearing traditional itchy wool long underwear,” Mitchell told me — and moved away from it, just as I did, with deep relief. But recent advances in fiber technology mean that the merino wool used by these companies is not the same stuff that raised red welts on my skin. I was able to see the advances with my own eyes. Virgil, who also has sensitive skin, wore the shirt that Icebreaker sent him for several days in a row without complaint and without an itch. And the socks didn't stink after even days of wear. Now that’s progress. High-performance clothing for children is also high-cost, however, and children can outgrow clothing in one season. Buying large works especially well for base layers, giving children several years of use before they outgrow an item. 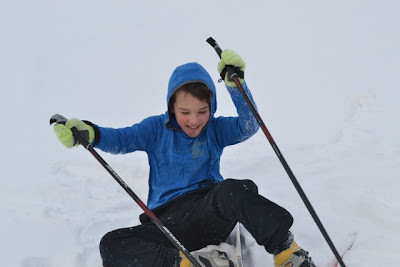 We’ve also been the grateful recipients of hand-me-down synthetic long underwear, fleece, and outerwear for our children since they were born, and we make a point of hitting local ski and gear swaps. The long underwear that Virgil is wearing this winter was worn by four kids before him, and it’s still good enough to pass along to a smaller child. I wasn’t surprised to learn from Mitchell that Icebreaker created its children’s line after the people who worked there started having children. At first, employees sewed baby versions of the company’s merino wool tops and bottoms out of sample fabric and gave them as baby presents. Getting a “baby Icebreaker” became something of a company tradition. Getting children into the outdoors, keeping them safe, taking care of the environment. That's a revolution I can join. Photo: Virgil, dressed in hand-me-down synthetic long underwear, fleece-lined water resistant ski pants, a wool shirt, wool socks, and fleece mittens — and happy even when down.